Over the past two weeks, I have watched Black girl after Black girl medal in the 2016 Summer Olympics. 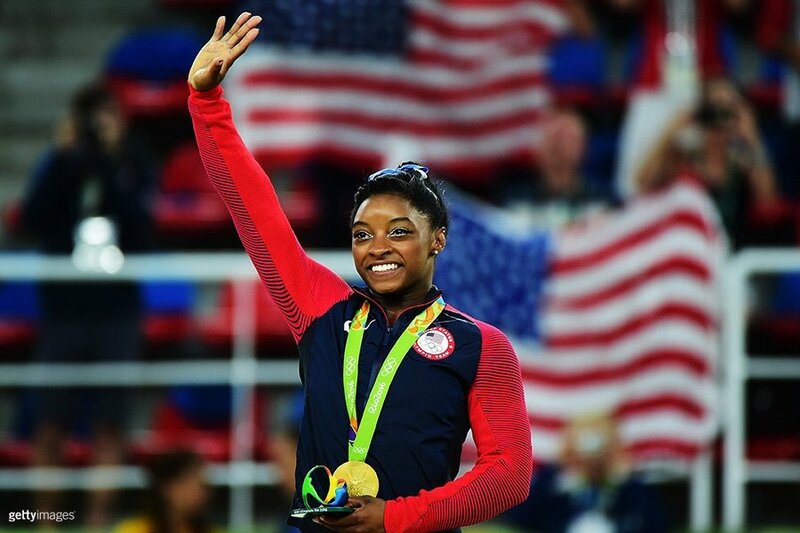 Simone Biles has dominated gymnastics. Simone Manuel did the same in swimming. Michelle Carter won gold in shot put. And, while I felt immense pride watching each of them claim victory in their respective sports, I can’t lie and say that I wasn’t conflicted about it all. Being Black and woman in the United States at this moment of history presents a unique set of challenges and hardships that cannot be easily conveyed. In the past few weeks, the violent deaths of Korryn Gaines, Joyce Quaweay, and Skye Mockabee make that point indelibly clear. But, I can’t imagine having to endure the kind of systematized, and institutionalized racism we do each day in addition to having to represent this very country abroad in ways that push one’s body beyond the physical and mental capacity most humans can ever hope to muster. This isn’t the first time Black people have successfully defended the United States’ winning record in the Olympics only to come home to the brutal reality that blackness is criminalized, rooted out, and annihilated as a functional mechanism of this country’s existence. In 1936, 18 Black athletes (including Jackie Robinson’s brother) competed in the Olympic games in Hitler’s Nazi Germany. During that tournament, they lived in a racially-integrated Olympic village only to come home to racial segregation in the United States. What is particularly interesting about those early Black Olympians is that two Black women, Tidye Pickett and Louise Stokes, were the first Black women to qualify for the Olympics four years earlier but were replaced with white athletes instead. In 1936, when they were given their chance to perform, Pickett broke her foot and Stokes was – once again – benched in favor of a white runner. That year, Black athletes won a quarter of the 56 medals won by the entire U.S. Team. But, that didn’t disrupt the systems of violence and racial animosity that would befall generations of Black Americans after the games. None of the Black Olympians were invited to the White House. None of them were treated any better than before they went to Hitler’s homeland to compete. Even more recently, Olympic sprinters Tommie Smith (gold medalist) and John Carlos (bronze medalist) were “vilified” after their epic “Black Power fist” demonstration on the medal box at the 1968 games in Mexico City. The two winning athletes were suspended from the team and received death threats upon returning home. These are the same histories that led me to turn my back on professional sports in the United States. The commodity culture of the NFL and NBA left me questioning how I could, in good conscience, support an industry that benefited from the physical strength of primarily young, Black men only to mine it for gladiator-style entertainment and throw them out once they hit the ripe old age of 35. The same can’t even be said of the WNBA since the franchise has struggled from its inception in 1996 to be taken seriously by many Americans. These are the racial histories of the Olympics and organized athletics in the United States. This is the scourge and the toil. This is the troubled ground which athletes like Biles, Manuel, Carter, Douglas, Felix, Dawes and Joyner-Kersee have sought to excavate, repave, and make anew, to brighten the athletic possibility and imaginary of the United States. To a certain degree, I understand how these young women’s physical prowess and historic wins bring tears to the eyes. I understand it as the same feeling many of us got when then-Senator Barack Hussein Obama took an oath and became President Barack Obama. But, Kiese Laymon cleared up any confusion about whether or not that was a “morally just” win some time ago. In some ways, Black women winning medals at the Olympics is symbolic more than a substantive move toward liberation. It doesn’t necessarily dismantle anything but it challenges a stereotype or reverses a backwards way of thinking. I am proud of them for reaching their athletic goals. These are major physical accomplishments. And, to date, these systems are the only ways that athletes can measure their agility against the best in the world. I get that. I’m just not convinced that’s enough right now. What we need is honesty about the ways that the Olympics, and organized sports in general, have always been a part of a white supremacist system of exploitation. A system in which Blacks have always been on the receiving end. We need to stop setting goals for our children that include representing a country that would rather see them behind bars or in a grave than on a podium giving a speech or receiving accolades. We need to stop hoping that medals, jerseys, Jordan’s, trophies, or White Houses will be the proverbial straws that break the racist camel’s back. So, excuse me if I’m not exactly dancing in the streets every time another Black girl sprinkles her magic on the infertile athletic grounds in the United States and manages to beat the odds again. We have done it before. We are going to keep doing it because that is what we do. But, the only race I am hoping to win is the one that ends with us all free. Sadly, that race can’t be run within an anti-Black system that never set out to free us in the first place.